Polyatomic Ions are explained in Chapter 3 Section 3.5 Guideline #3. 3. However, if these two or more elements bonded together have a net ionic charge, then this group of atoms is a called a Polyatomic Ion and it is only one half of a compound. a. Some give the students a list (or the table in the textbook) and require them to memorize the formulas and the charges. b. Then others provide the students with a list, but allow the students to use the list on exercises and tests. c. Some only allow the students to use the list on the first test, and expect the students to learn through rote usage the formulas and charges, but do not allow the list on future tests. P.S. Also, some faculty provide a crutch by allowing the students to write notes, problem solving formulas, and also polyatomic ions on a single piece (Crib Sheet) of paper to use during a test. So how do we teach Polyatomic Ions? 11. In my 1025C, 2045C, and 2046C classes I give them list from the current textbook. I ask them to memorize the list including names, formulas, and charges. The next class period they take a test on this list. This is step 1 that I use in these three classes, mainly for the student to understand that having these Names, Formulas, and Charges at their fingertips for the next year is a difficult task. Ok, many take a test just to pass, then a week later they have buried the links in their brain to the formulas and charges and write nitrate’s charge as -2 instead of -1 and the put four oxygen atoms in the formula instead of three. 1. What is the formula for the –ate polyatomic ion? 2. What is the charge on –ate polyatomic ion? 3. What happens when you attach hydrogen atom(s) to the polyatomic 2- and 3- anions? 4. 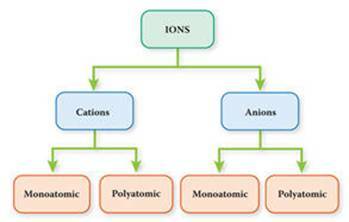 What does –ite mean in a polyatomic ion? 5. How do the hypo- and per- prefixes apply to polyatomic ions? 6. What are the two –ide polyatomic negative charged Anions and the two -ium positive charged polyatomic Cations? 14. Here is my solution to the problem created for them. I teach two algorithms that if they learn, then at anytime they can look at a periodic chart and figure out the Polyion’s formula and charge, but before they learn to use these algorithms they must have studied bonding (Chapter 6). So what do we do in this CHM 1020 class? Suchock’s table does not have enough ions. 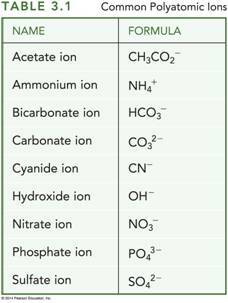 This is CHM 1020, so you do not have to memorize any of the ions, just know how to use them in writing chemical formulas of ternary ionic compounds and also ternary acid compounds. available when you are writing chemical formulas.